Last week, Community and Artist Relations Manager Ernesto Alordo wrote about his recent talk with Eglise Gutiérrez. Ernesto also sat down with Nuccia Focile, who sings Violetta in our Saturday and Wednesday performances of La Traviata. Enjoy! In comparing Violetta to her other roles at Seattle Opera, which include Tatyana in Eugene Onegin, her company debut, Mimi in La bohème, Nedda in Paglicacci and the title role in Gluck’s Iphigénie en Tauride, I asked if she finds similarities between these heroines and Violetta: “Well, all these roles do have some similarities; however, Violetta from the technical point you find more demanding singing in Act I with, Ah!, fors’ e lui and Sempre libera , where the tessitura is quite high and with a great deal of coloratura. Act I has a lot of the belcanto style and it is very demanding for the soprano, actually terrifying! 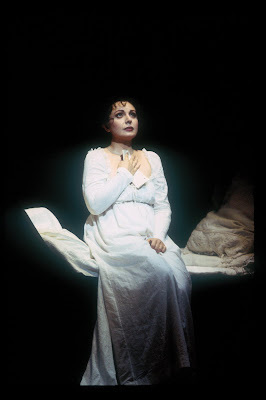 The rest of the opera is much lyrical and closer to Mimi, Nedda in a way, even to Iphigénie, more of the verismo style.” Asked about her colleagues in this cast, she has not worked with any of these colleagues before but she is happy to say that a very nice relationship developed very quickly with members of both casts. "We are very supportive of each other and it is a wonderful feeling to have such colleagues around." 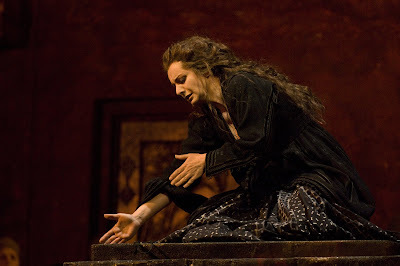 Focile in her Seattle Opera debut as Tatyana in Eugene Onegin. October 2002. View photos of Nuccia Focile (and the rest of the cast!) from the current production of La Traviata here.